With a new take on growth, Cherry Hill maintains its business-friendly attitude. For business owners and local leaders alike, Cherry Hill is a township marked by continuous growth, redevelopment and an increasingly business-friendly atmosphere. In short, business is booming—again. 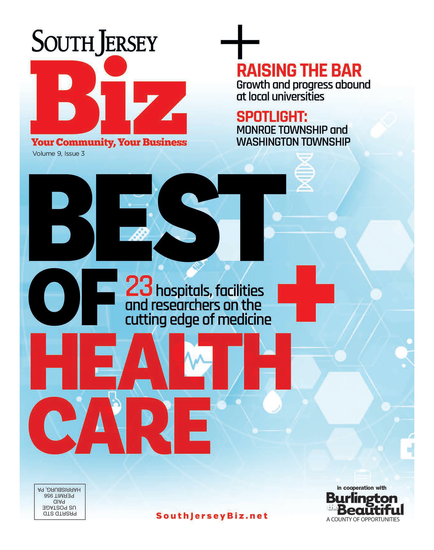 “Between both the geographic location and the attitude of the administration that is in place in Cherry Hill Township, they really are ‘open for business,’ and are doing everything possible to revamp some of the fallow locations or properties in town,” says Ernest Del Duke, chairman of the Board of Directors of the Cherry Hill Chamber of Commerce and owner of Del Duke Insurance Group, which has called Cherry Hill home for 31 years. Redevelopment of underutilized sites has become the norm in Cherry Hill, including one major undertaking: the redevelopment of the former Syms department store on Route 70. The township’s planning board recently approved the Penn Medicine Project, a $50 million transformation of the 150,000 square foot former department store into a state-of-the-art medical center, to provide medical services ranging from cardiology to radiation to primary care to obstetrics/gynecology, even a pharmacy and an urgent care, just to name a few. The redevelopment will also include a 1,600-square-foot addition, as well as a 405-car enclosed parking garage. The medical presence in Cherry Hill is also undergoing a revitalization. Kennedy Hospital, at Cooper Landing and Chapel Avenue, has recently broken ground on a new medical office building and a square foot surgical center for 102,000 square feet, an indoor parking garage, a future patient pavilion, and a full campus reorganization; LourdesCare at Route 70 and Brace Road recently added an urgent care; Virtua will soon follow suit, adding an urgent care, family medicine and imaging services; and Bancroft has recently set up their consolidated administrative offices in Cherry Hill. Another sector of Cherry Hill has also seen some growth in recent years—food and drink. Since opening about a year ago, the 55,000-square-foot Whole Foods in the Ellisburg Shopping Center has encouraged more growth, Palmer notes. “[It] has spurred upgrades, new businesses and raised the bar for the entire Ellisburg Shopping Center,” she says, noting that Ellisburg is Cherry Hill’s original retail strip center. New restaurants in Cherry Hill include Honeygrow and Jules Thin Crust, both also in the Ellisburg Shopping Center; Zoe’s on Haddonfield Road; Starbucks on Route 38 in front of Walmart; and a new McDonald’s at Route 38 and Church Road Circle. Forgotten Boardwalk Brewery, a new micro-brewery in the Springdale industrial area, is another new addition to the township. Keeping with the township’s theme of redevelopment, Aldi will soon be on the site of the former Bottom Dollar on Route 38; Rockhill Restaurant is a redevelopment of former Big John’s on Route 70; Ichiban Buffet took over the former Old Country Buffet site on Route 70; Turning Point is now located on Haddonfield Road at the former Pier One site; and Wawa now sits on the former Blockbuster Video site on Route 38. And retail is not to be left out of the equation regarding Cherry Hill’s success. A new Kohl’s outlet store, Kohl’s Off Aisle, recently opened its doors at Route 70 and Old Orchard; a new Audi dealership showroom and service facility on Route 70 is currently under construction; several new shops and eateries have opened at Garden State Park, including Pier One; and a new shopping center to include a McDonald’s and other retail at Route 38 and Coles Avenue is currently under construction. Cherry Hill also worked with the United States Post Office to keep the Ellisburg Station Post Office in the township and was successful, as the new post office will relocate to the CVS Shopping Center at the corner of Chapel Avenue and Kings Highway, slated for a late summer opening. Residential development is another area of growth. “Residential development is underway as well, which is interesting for this area, because so many happened at one time,” Stridick says, noting Garden State Park, Regency Court, and The Grand as areas where there has been development—whether it’s a newer residential and retail mega park like Garden State Park; a new approach to a failing subdivision, such as with Regency Court; or ground floor retail that wasn’t doing so well repurposed into more apartments, such was the case at The Grand. “We’re looking at sites that just need a little help, working with property owners and developers all through town and brainstorming some really good solutions and resolutions to their problems,” Stridick says. Cahn also notes that single family home ownership is up. And they’re not done yet. The Cherry Hill Township Council has also designated two other areas as areas in need of redevelopment—meaning, they’re next in line. These sites include the Park Boulevard area, the current site of America’s Best Value Inn and former World Harvest Christian Center/synagogue, encompassing 7.3 acres along the revitalized Cooper River Park; and Hampton Road area, the former WB Saunders site along Hampton Road, including the Verizon work yard along Cuthbert Boulevard, for a total of 19.4 acres along Hampton Road through to Cuthbert Boulevard. But there is a balance, officials say. Cahn agrees. “There is a balancing act for the residents—not developing open space, not taking out trees. We’re talking about utilizing underutilized spaces,” he says. And local business owners name the ease of doing business in Cherry Hill as a major draw. Doing business in Cherry Hill has been a positive experience so far. “It’s great. … People have been very receptive in this area,” Drozen says. Published (and copyrighted) in South Jersey Biz, Volume 5, Issue 7 (July, 2015).